Assists lenders who offer government-guaranteed lending in assessing the size, viability and legitimacy of business lending applicants. Provides On-Site Verification of applicant’s physical location and business operation. Satisfies the site visit requirement of SBA as part of Its 7(a) lending program. Substantiates representations made on SBA lending application. The SBA guarantees business loans to businesses based on specific aspects of the business and its principals. Some of the key factors of eligibility are based on what the business does to receive its income, the character of its ownership and where the business operates. and a national network of well-trained, vetted professional inspectors. 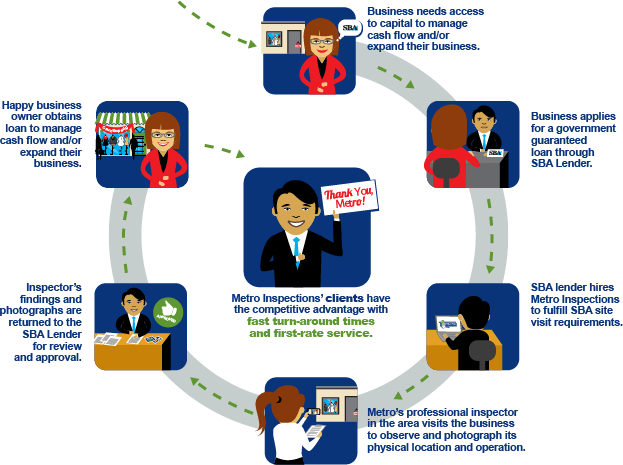 Metro Inspections will assign an inspector to visit the business location and verify the applicant’s operations, locations and type of business conducted. While there are only a few items the SBA requires verification of, this is a unique opportunity to use the visit as an underwriting tool to verify any other factors the lender deems relevant. Metro Inspections will then analyze, scrutinize, and compile the results in order to submit them to the Provider through our state of-the-art Inspection Management System. The SBA lender is then able to assess the findings as they make final determination on the approval for business lending.